On the 16th of August the Department of Health Science Education hosted the 10th annual Celebrating Health Science Education (CHSE) conference, which also formed part of the commemoration of the 40th anniversary of the Declaration of Alma Ata. In line with the current emphasis on Primary Healthcare, and the conference theme of ‘From Isolation to Integration’, the keynote address by Dr Tracey Naledi, board chair of Tekano, focussed on ‘Expectations of graduates from a Faculty of Health Sciences, in light of Alma Ata’. Dr Naledi powerfully argued that health is fundamentally about social justice, and that it is time for a transformation of the healthcare system. Drawing on a variety of sources, she showed how the majority of wealth in the world is controlled by just 1% of the population, and that earning more than R500 000 a year position’s you within the wealthiest 10% globally. At the other end of the spectrum, the face of poverty is predominantly black and female. During her presentation Dr Naledi advocated strongly for everyone to take responsibility for these inequalities because, while leadership and governance matters, the only way to achieve real change is though multisectoral collaboration. She spoke passionately about the need to properly engage with, value, and compensate our community health workers as the ‘people on the ground’, who actually understand the lived-contexts of our patients. This, she stressed, as particularly important given that addressing the social determinants of health has the greatest impact on well-being, beyond just the individual, but at the family and community levels as well. Dr Naledi concluded by highlighting the need for a reorientation of the healthcare system towards ‘person-centred healthcare professionals and services’ that engage and empower patients. The principals, themes and issues raised during Dr Naledi’s address were reiterated throughout the 16 presentations of the day, with the structure and nature of the conference attracting a robust mix of innovative, and research-driven presentations by undergraduates, postgraduates and staff. The judges, Dr Ronel Maart and Dr Sherran Clarence, both commented on the high-quality of the well-theorised and polished presentations, which exemplified the principals of Primary Healthcare as applicable to Health Science Education. 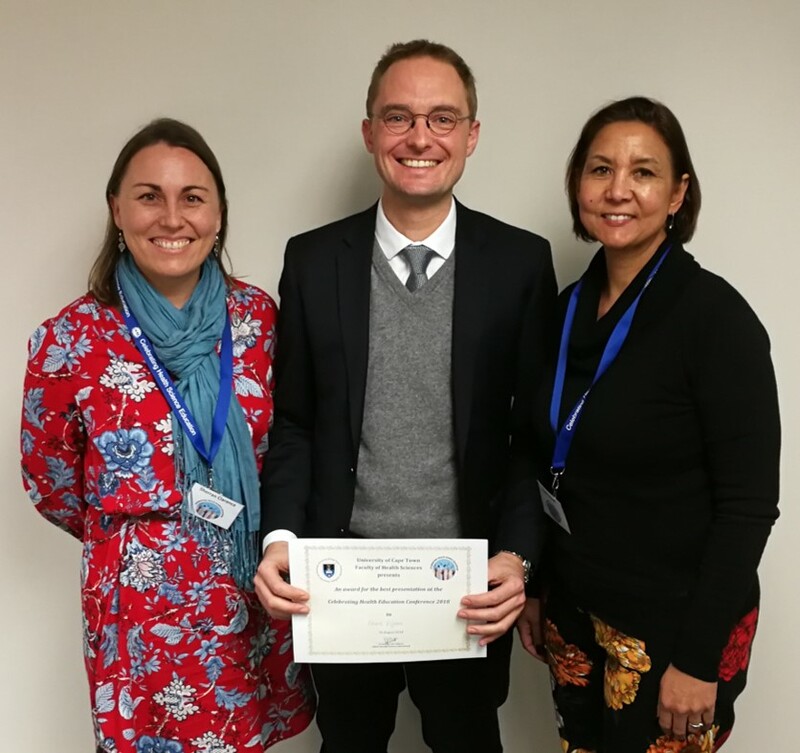 They awarded the first prize of an R8000 research grant to Dr Charle Viljoen for his presentation on ‘A prospective cohort study comparing blended learning with lecturer-based training in electrocardiography’. Second place went to Dr Natashia Muna for her presentation on ‘A novel approach to Patient Partner recruitment and training’, with the third prize being awarded to Prof. Theresa Lorenzo for her presentation on ‘Developing self-mastery of community care workers through narrative action reflection workshops’. Dr Maart concluded the prize-giving by saying that her experience of the day was what education is supposed to be about – everyone from undergraduates to postgraduates and staff working together on cross-cutting issues.